“A Dip in The Light” oil on wood. 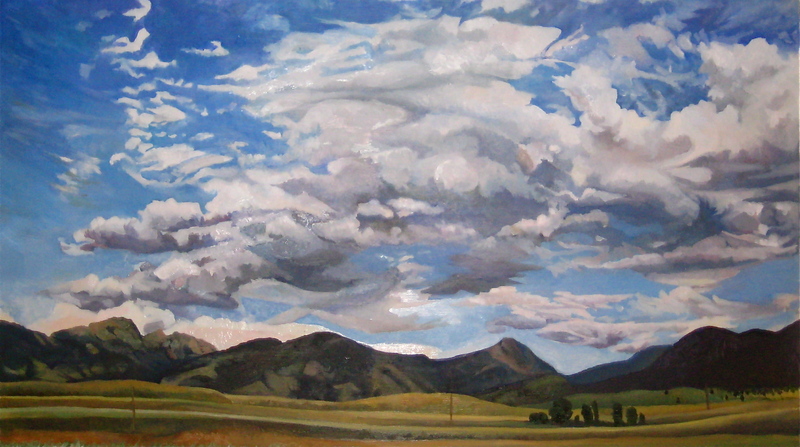 16″ x 24″. sold. Limited Edition (1/50) Giclee Prints available. 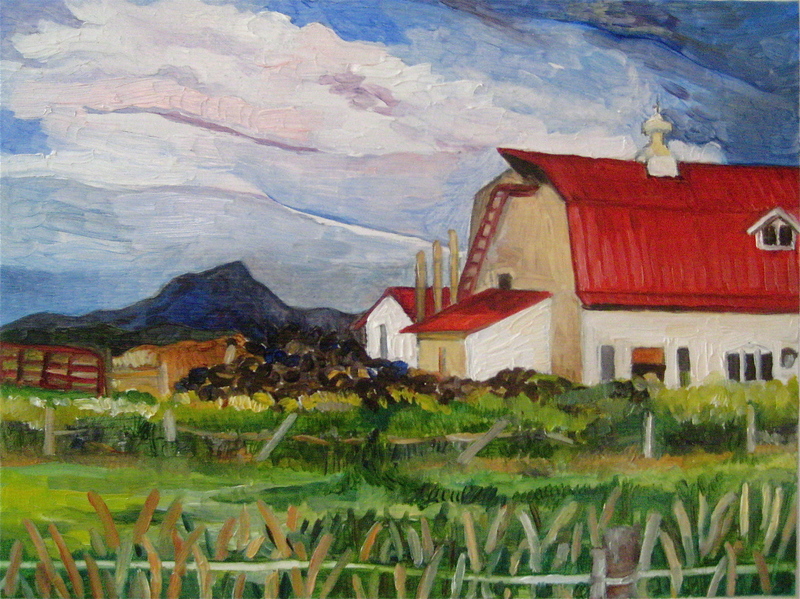 “Nordic Farms Roof” oil on wood 12″ x 26″ . sold. Limited Edition (1/50) Giclee Prints Available. “Story in the Clouds” oil on wood. 24″ x 36″ sold. Limited Edition (1/50) Giclee Prints Available. “August From Mt. Philo” Oil on Wood. 9″ x 49″. Commission. Limited Edition (1/50) Giclee Prints Available. “Last of the Golden Leaves” 12″ x 12″ oil on wood. sold. Limited Edition (1/50) Giclee Prints Available. “Autumn Evening from Mt. Philo” 14″ x 40″ oil on wood. Commission. Limited Edition Giclee Prints Available. 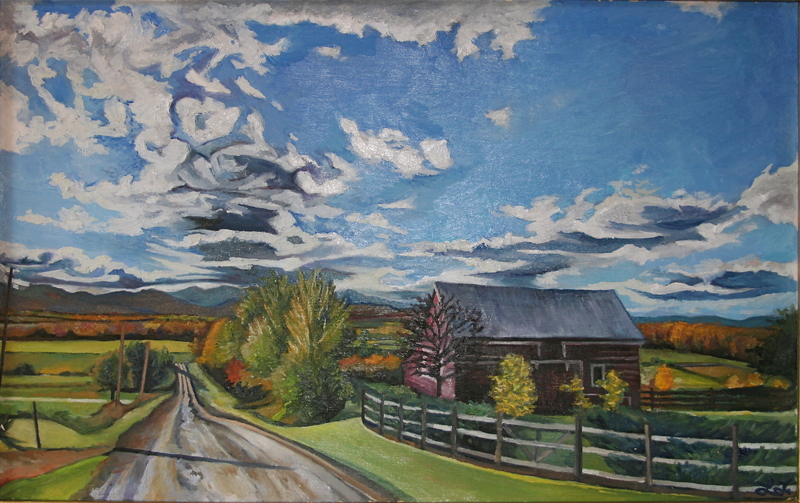 “At Wilmarth Rd” 14″ x 22″ oil on wood. sold. Limited Edition Giclee Prints Available. 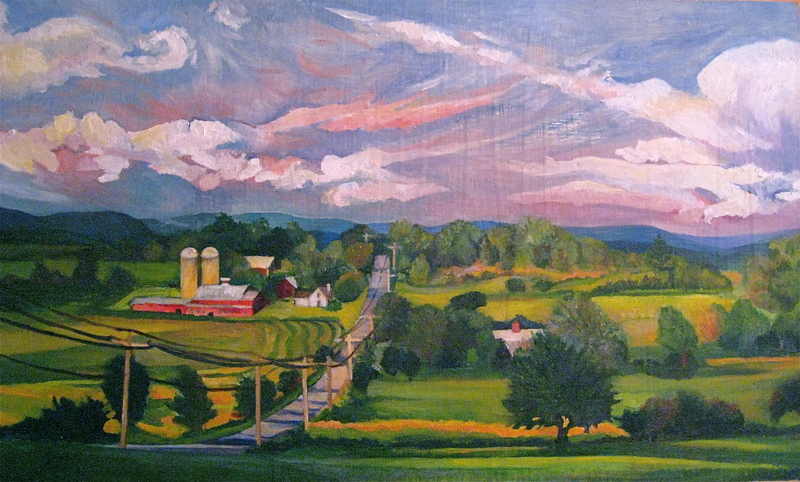 “Little Red Barns” oil on wood, 4″ x 12″ sold. Giclee Prints Available. “Early Autumn From Mt. Philo” Oil on wood. 14″ x 40″. Sold. Limited Edition Giclee Prints Available. “Mt. Mansfield in Manganese Blue Air” Oil on wood. 8″ x 12″. Sold. Prints Available. 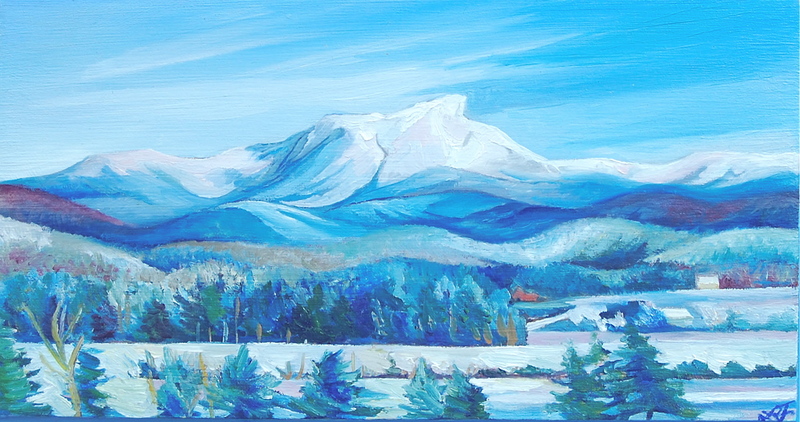 “Camel’s Hump Blue Air Winter”, 8″ x 12″ oil on wood. Sold. Prints Available. 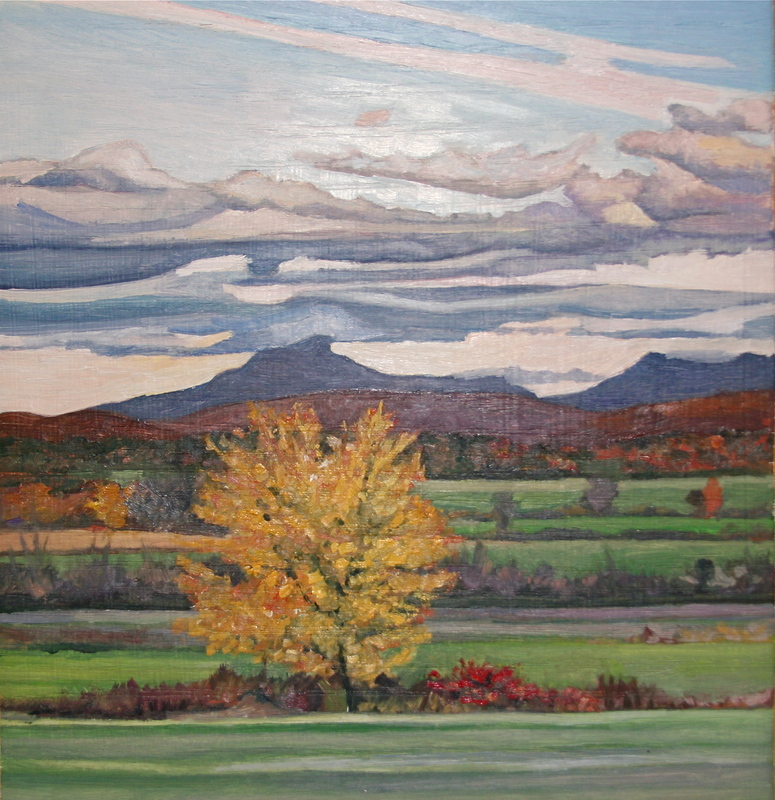 “Red Roof Meets Camel’s Hump” oil on wood. 8″ x 10″ sold. 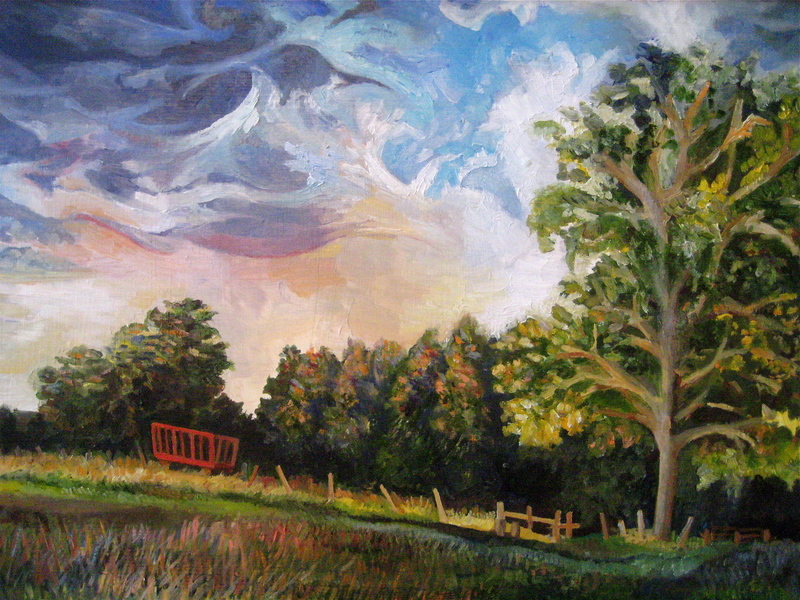 “Hay Collector by the Oak” oil on wood. 16″ x 20″ sold. 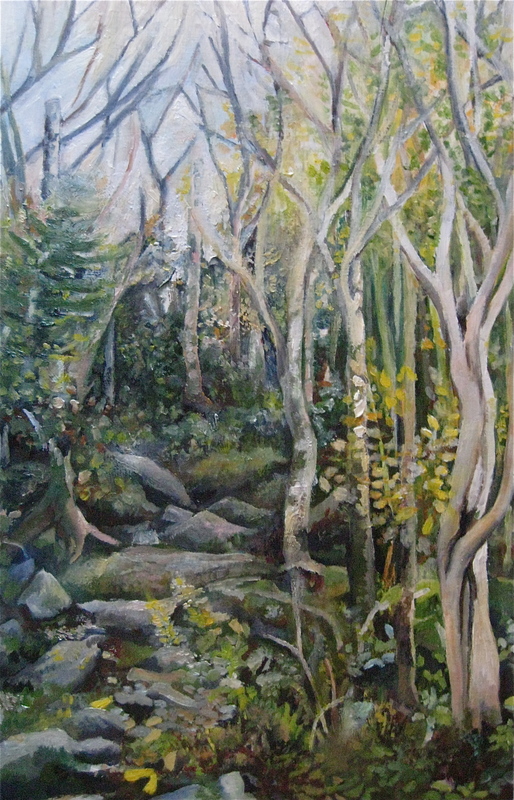 “Long Trail Forest” oil on wood. 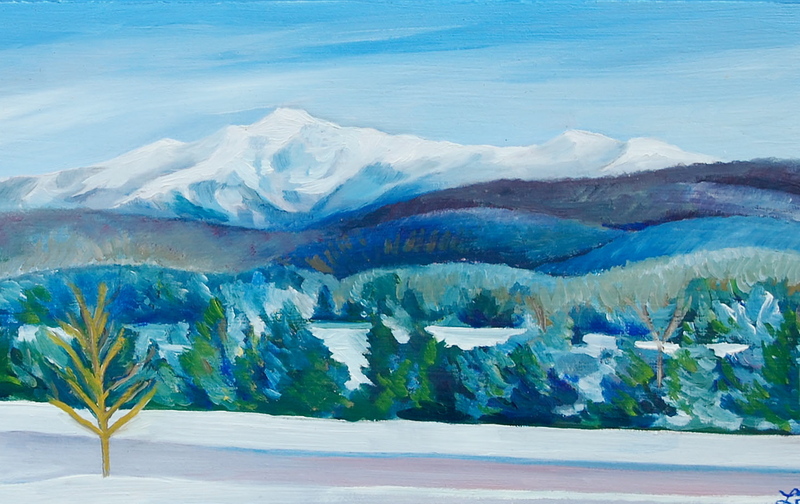 20″ x 12″ sold. 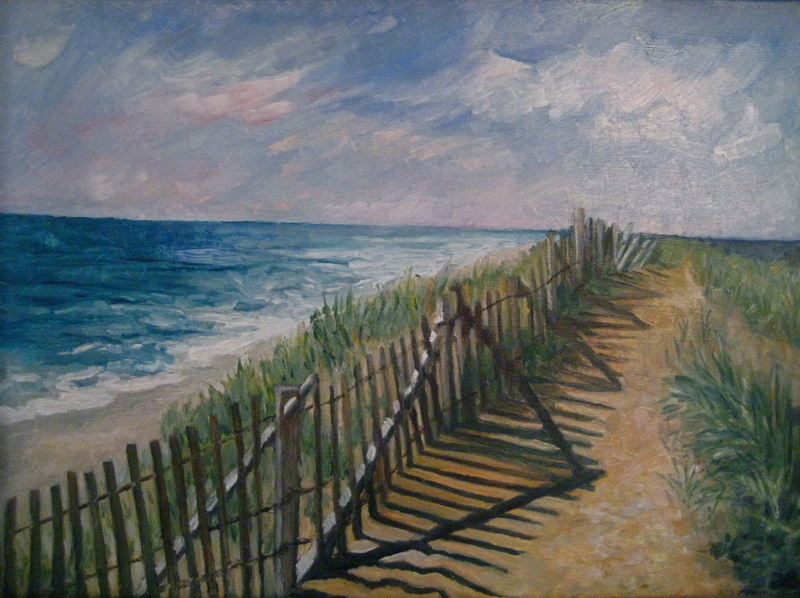 “A Walk By the Dunes” oil on wood. 8″ x 14″ sold. 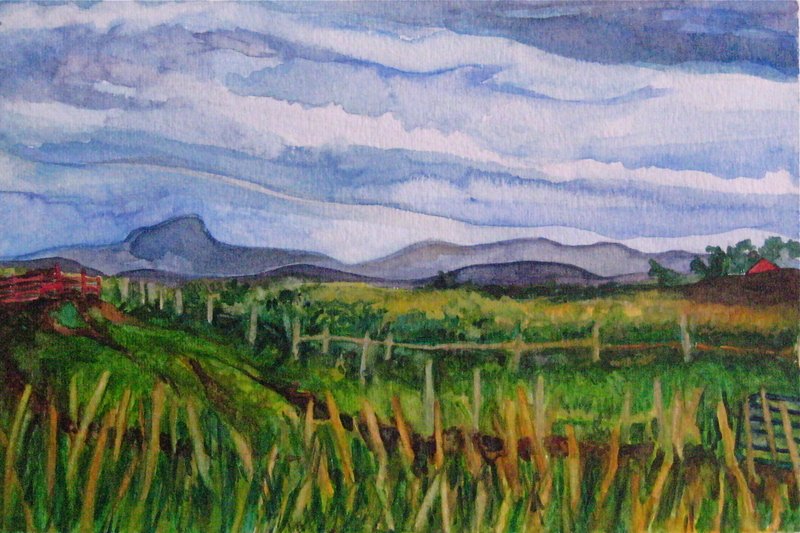 “Camel’s Hump Blue” watercolor. sold. 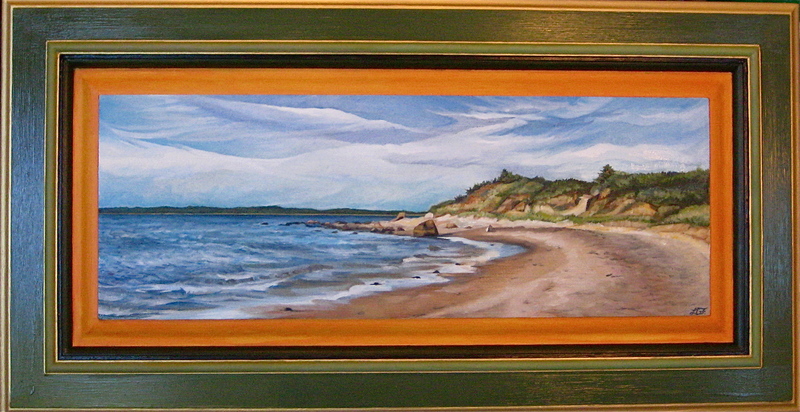 “Shelburne Beachscape” oil on wood. 4″ x 20″ sold. 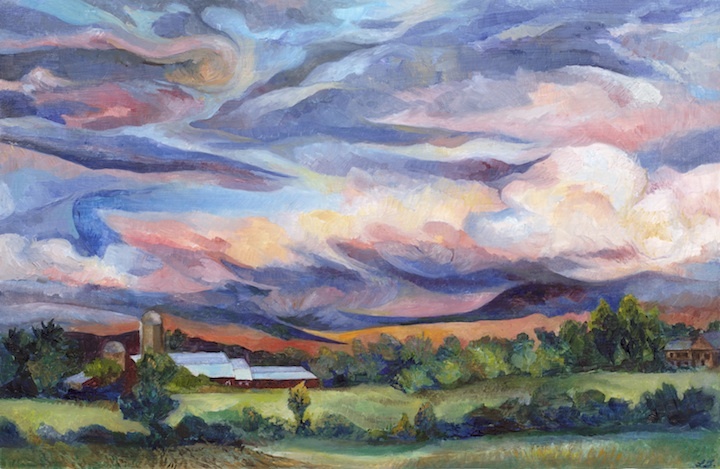 “Rte 7 Sunset” oil on wood. 10″ x 40″ sold. “Quiet Cloud” oil on wood. 12″ x 32″ sold. 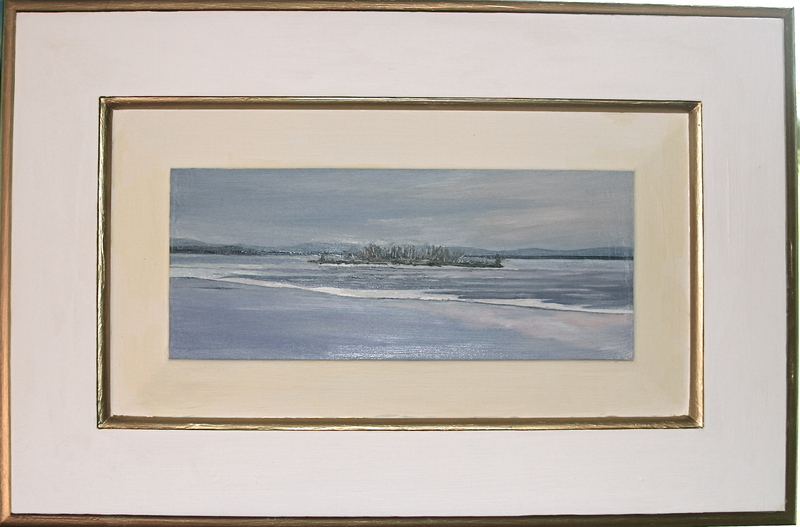 “The Rock at Lambert’s Cove” oil on wood. sold. “Lavender Winter” oil on wood, sold. I LOVE view from the bridge… Evening sky’s like those are so magical. Glad you now have a place online to share your work, it’s beautiful! Your view from the bridge is the one piece of art we’ve taken the time to hang up in our new home. I look forward to seeing your art again at the Farmers market this summer.